Chris has been making beersamic at work for many years. He always has it on his menus. Sometimes it is drizzled over the grilled peaches in a summer salad or the roasted beets in a winter one. Sometimes poultry or fish are marinated in it prior to any thermal interventions. Sometimes pounds of Brussels sprouts are tossed in it and then roasted. Over the years I’ve eaten many of his dishes with beersamic and have always been impressed with the flavors it adds to a wide variety of food. Yet we don’t make it often enough at home. This is about to change. Beersamic tastes so much richer than your regular store bought balsamic glaze that the 10-15 min that it took Chris to make the small quantity for this post were absolutely justified. In one word – it is a reduction. This simply means that the volume of a liquid is reduced through evaporation and the flavors are concentrated and thus intensify. 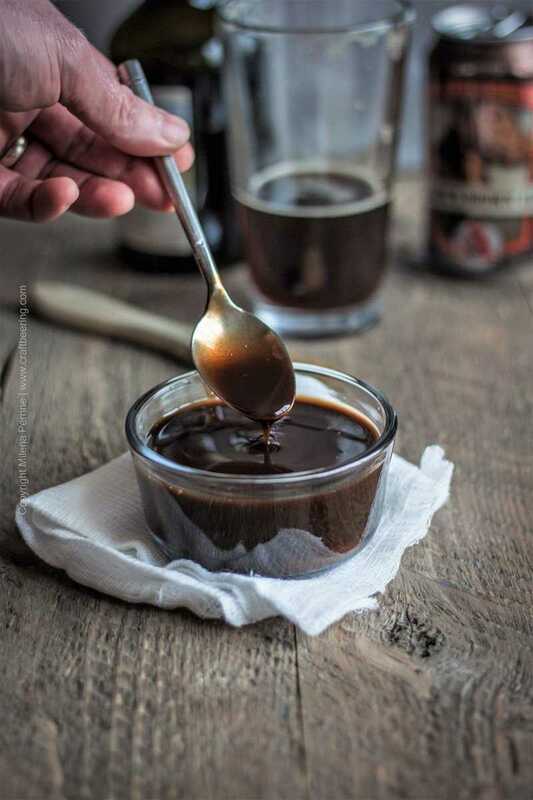 In this completely legitimate cooking with beer instance, a predominantly malty beer and balsamic vinegar are simmered until transformed into a thick, glossy, enticingly nostril tickling viscous liquid. 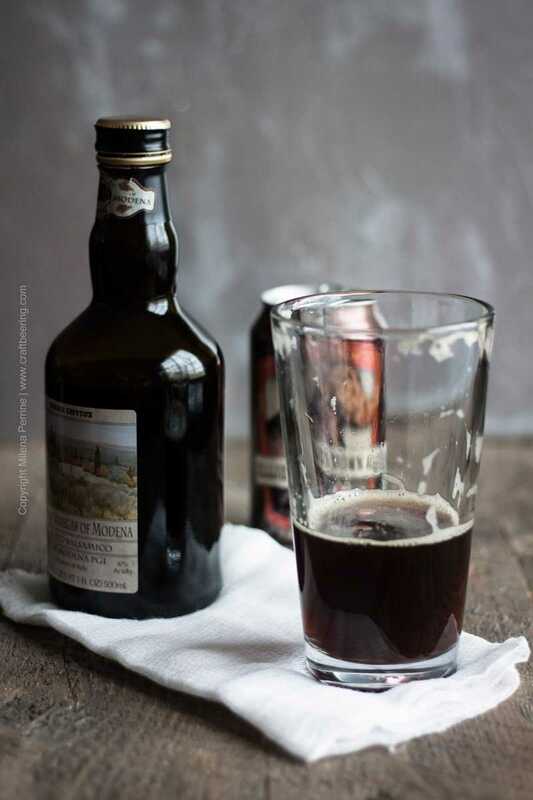 The acidity level of the resulting syrup is lower than that in balsamic vinegar because both the water and the acetic acid evaporate, while the boost in sweetness is due to the extra sugars contributed by the beer. The syrup is very versatile in its uses and can be used to add flavor to both savory and sweet dishes. The ratio of beer to balsamic vinegar that Chris recommends and always uses is 1:1. 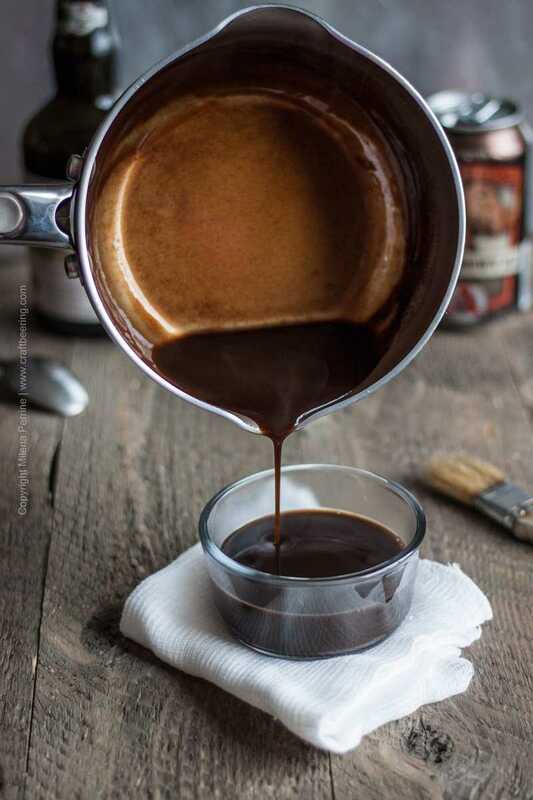 The starting liquid base needs to be reduced by half over medium heat (sometimes a little bit more, depending on the quality of the balsamic vinegar). Typically the decision of how much of each ingredient to use hinges on how much beersamic you need. 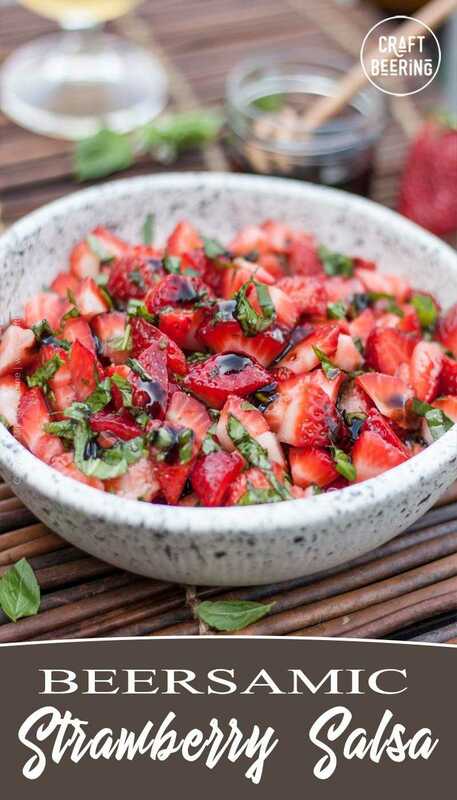 If you’ll be using it to drizzle over a party sized platter of bruschetta, you may need about two cups, in which case you’ll start with two cups of beer and an equal amount of balsamic vinegar. Typically, a small(ish) sauce pan will be sufficient, but if you are making a larger batch choose a wider pan to leverage the increased surface area (faster evaporation, less time needed to reduce to the desired consistency). 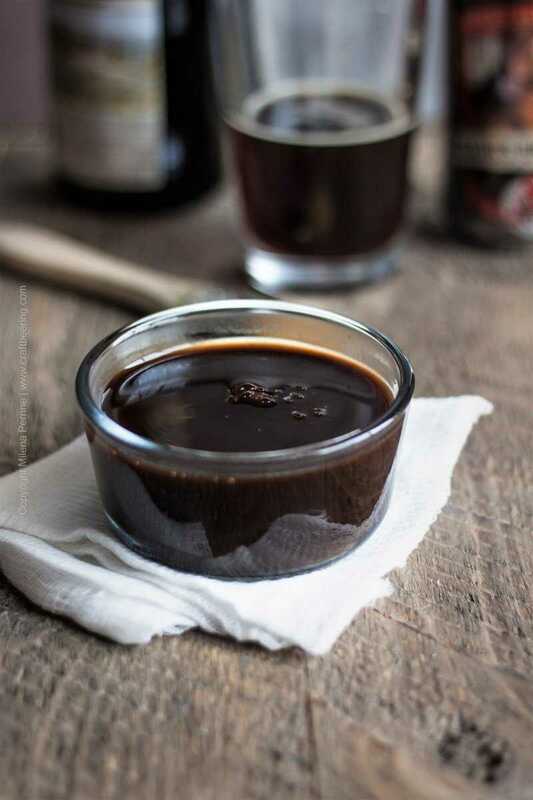 For this post Chris used a cup of beer and a cup of balsamic and with the resulting one cup of reduction was enough for us to use in two different recipes. There is an extra thickening step you can employ if you need the beersamic for finishing purposes versus marinating/glazing. When you brush the syrup over vegetables you are roasting or marinating chicken, the naturally occurring consistency of the ingredients reduced by half is perfect. If you however want to drizzle it over grilled veggies or a caprese salad, you’ll need it to be extra thick and sticky. You can achieve that if you reduce the initial liquid base by more than a half or if you thicken the half reduced syrup by adding slurry (arrowroot/cornstarch/potato starch + cold water) and thicken its consistency. See the recipe for precise instructions. Do not be tempted to thicken the syrup before you have reduced it by half and speed up the process. The taste of your beersamic is contingent on that concentration of flavors. Read this related post to learn How to Make Hop Salt. Your creativity need not be contained to selecting a craft beer style. 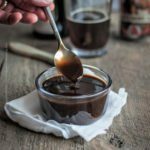 It is entirely possible to add even more layers of flavor to beersamic by simply simmering suitable ingredients in the beer and balsamic mixture. If you simmer garlic, shallots, peppercorns, bay leaf or rosemary, orange zest, figs, dates, raisins etc., your reduction will be infused with the corresponding tastes and aromas. Chris suggests you start with a smaller quantity of the added ingredient and fine tune it to your taste preferences each consecutive time you make beersamic. You will need to strain the reduction through a fine mesh strainer before using it so as to remove the flavoring agent(s) from it. If you are thickening the syrup, do strain it before you begin to add the slurry. Any limits to the uses of this delicious reduction can be imposed only by a crisis of imagination. Just in case, here are several tried and true ideas. 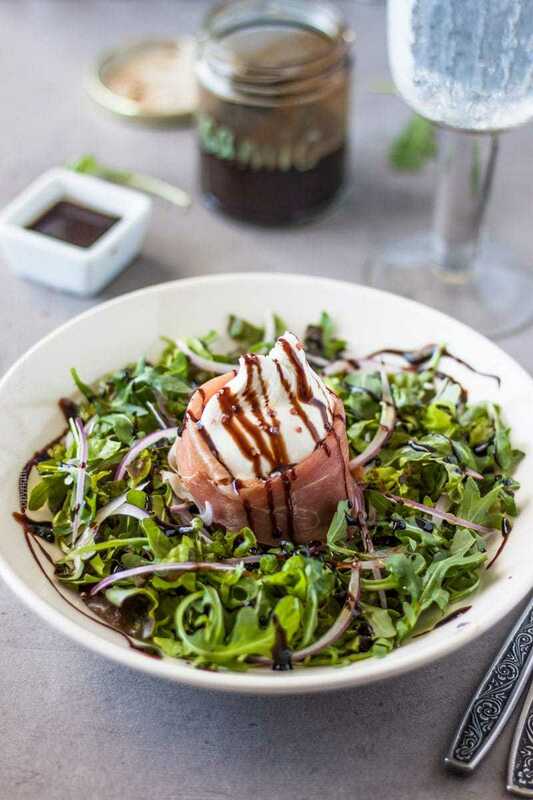 How about this prosciutto wrapped burrata cheese and greens salad? 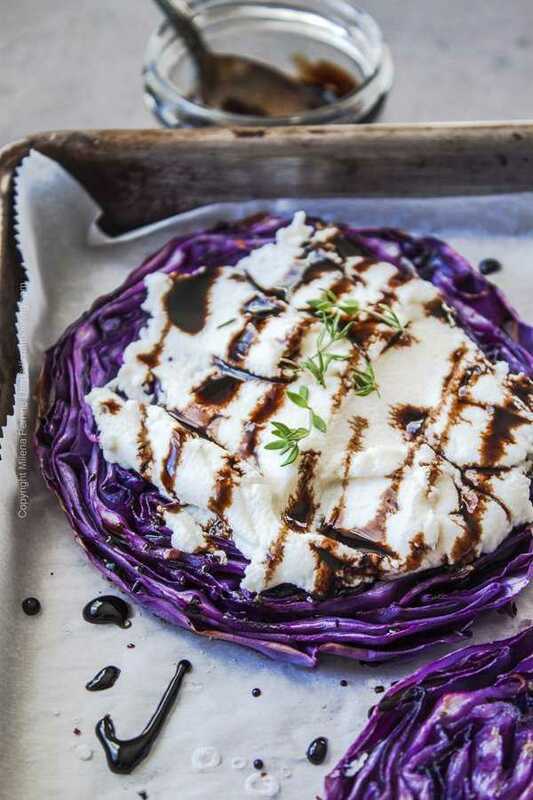 Or maybe roasted cabbage steaks? Beersamic is a flavor packed reduction of predominantly malty beer and balsamic vinegar. 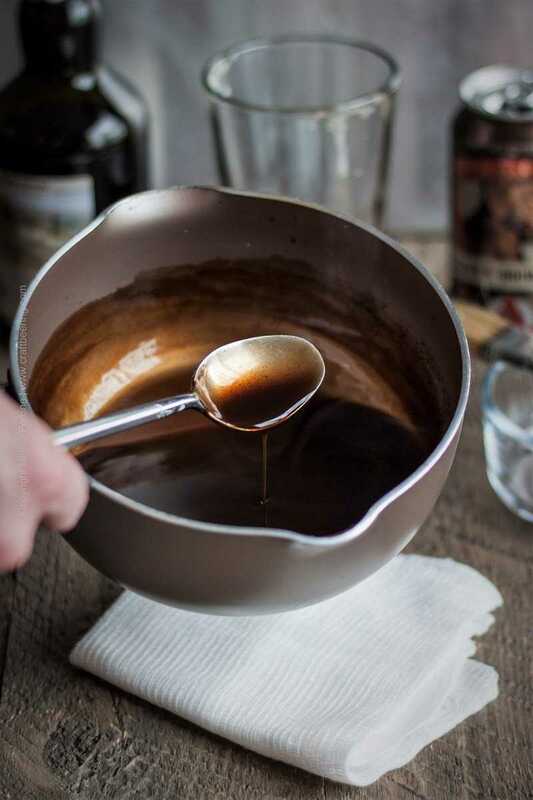 Combine the beer and balsamic vinegar in a small saucepan. Bring to simmer over medium heat. Watch it closely as even a small increase of temperature can cause the beer to foam up and overflow. Simmer until reduced by half and thickened (about 12-15 min). Remove from heat and let coo off (it will thicken some more while cooling off). *If you want an even thicker consistency after the liquid is reduced by half, add slurry while the pan is still over the heat. Add a bit of the slurry at a time and stir. Keep adding until you are satisfied with the consistency. **If you want to infuse the beersamic with extra flavors, add the ingredient before you bring the liquid base to simmer and remove once it has reduced by half. Strain before letting the syrup cool off and (if thickening) before you add any slurry. You guys are amazing!! Got to love Beersamic! Thank you for sharing this recipe at ‘Create, Bake, Grow & Gather’ on Shabby Art Boutique this week. I’m delighted to be featuring your Beersamic at tonight’s party and pinning too! Thank you so much, Keryanne! I learn something every day. Beersamic, how interesting. Definitely trying it out. Pinned! This is such a fun and creative (and I’m sure delicious) addition to the kitchen! Definitely going to try this out! Thanks so much for sharing! Thank you so much Sara for stopping by! Holy wow, I would have never thought of this. Thanks for sharing at the #happynowlinkup! Pinning. I WILL be making this! So glad you’ve joined us again for the What’s for Dinner party! mmmmm shared to facebook I know a lot of my friends will love this! Sweet! Thank you so much, Laura! Haha, that is brave! Thank you, Kelly! OMG this sounds amazing. We just had two new breweries open up near us, and I can’t wait to find one of their beers to use for this. Thanks so much for sharing at the #happynowlinkup! I love this idea of a reduction….can see it on everything from roasted veggies, to vanilla ice cream! Thanks so much for sharing this recipe with #FridayFrenzy! That looks tasty! I love balsamic vinegar. I have to try this, it looks and sounds absolutely amazing!!! I’m telling you…that name!!! You guys nail it! Lol…It does sound pretty self-explanatory:) Thank you, Marvellina! DANG I love this website. I seriously learn something new every time I stop over. I’ve never heard of beersamic before but you best believe I’m making it soon! Pinning! OMG, I can see how you and Kieran will come up with a most revolutionary use of it too. Who knows, maybe you’ll decide to churn beersamic ice-cream rather than simply drizzling beersamic over ice-cream:) You are both such a riot! Oh, yes! A jar of beersamic would be a lovely twist on the classic for your basket recipients:) Great idea, Dawn! This is brilliant! I love balsamic so much. There’s a pizza place down the street from me that has balsamic reduction as a topping option and I always order it but I think next time I’ll make my own beersamic instead. I’m swooning a little at the thought :). Have a great week! Thank you, Jennifer! 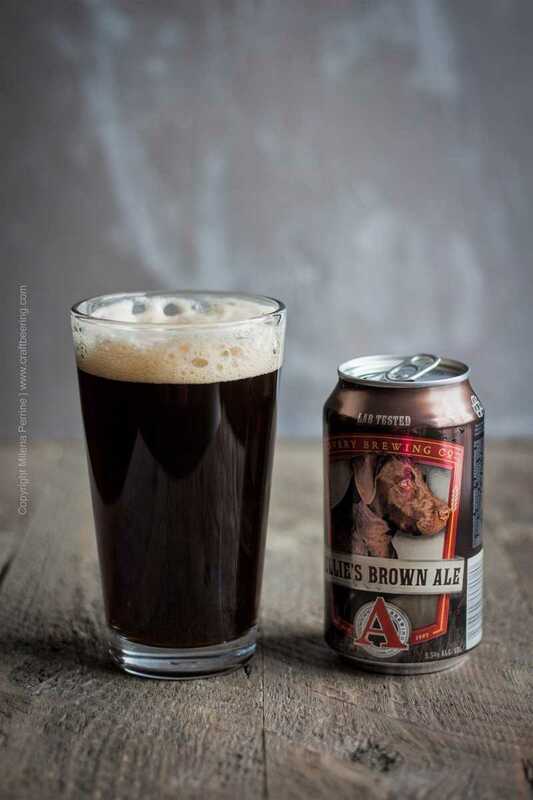 Absolutely true – very versatile uses for beersamic and the maltiness of beer gets leveraged so effortlessly.